In our annual Reliability and Service survey, where we ask PCWorld readers to assess their experience with the tech products and tech support they've used in the previous year, Canon always earns high ratings for customer service in its product categories (specifically, printers and cameras, though last year we couldn't rate the company's camera service and support because we received too few responses on those measures). 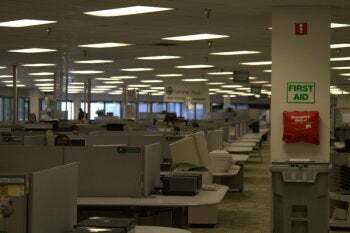 After reading some of the glowing praise that Canon customers have volunteered on behalf of the company's help system, I was curious to see the place that handles its tech support. I attended a sort of press retreat at Canon's facilities in Williamsburg, Virginia, last week, touring the large facility where broken Canon products go to be repaired, refurbished, replaced, or retired. 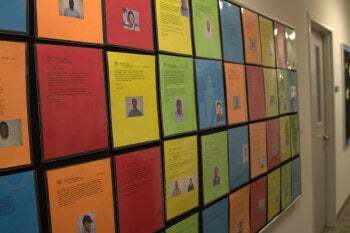 That afternoon, the folks at Canon took me on an unscheduled trip to Chesapeake, 44 miles to the southeast, to check out the center that provides customer support for all of Canon's printer and camera customers in the United States. Canon support is big on friendliness, and the company goes a long way to ensure that its reps are friendly on the phone. The facility itself reflects Canon's emphasis on positive, professional customer service. One of the first things you notice when you enter is how open, spacious, and tidy the work environment feels. The workstations have very short dividers, enabling everyone to see everyone else. The walls around the outside of the center are composed of glass, so there's a lot of natural light and you can see outside. "It's a cliché but you really can hear a smile across the phone," says Brian Griggs, Canon's director of customer support. "We try to foster a friendly environment where people can be happy about their job. The rest is just blocking and tackling." "You can teach people the technology and the products, but you can't teach people to be nice and to be likeable and to be happy where they are," Griggs says. Of course the most important task is to fill the facility with intelligent, friendly reps who really want to help people. When recruiting, Canon looks for two main things in potential reps: natural friendliness and the ability to do repetitive work. 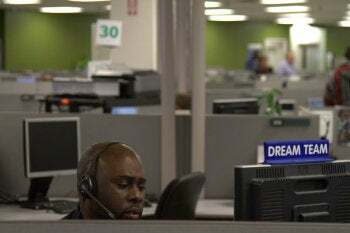 Griggs says that Canon puts potential support center employees through a number of screening methods that are designed to find people who are naturally personable. He says that he likes to interview candidates multiple times on different days to find out what they're like on a day-to-day basis. This eliminates the chance of talking to a candidate on a particularly "up" day, and then seeing a different sort of person after the hiring. In addition to being friendly, Canon reps must be able to handle repetition. Support reps don't have a choice about whether to answer a call; calls are always queued up and waiting. When the rep finishes one call, he or she hears a pleasant tone, and the next call begins. And since each Canon rep supports a single kind of product--either printers or cameras--with very little crossover, reps may hear all day long from customers who have the same or very similar problems. Griggs says that Canon is fortunate to be located in an area that has plenty of military bases nearby, full of good potential candidates to recruit. He explains that people who have lived in a highly ordered military environment often possess a high tolerance for the repetition of Canon support work. After reps are hired, they find a lot of support systems in place to help them maintain their friendly tone on the phone. According to Griggs, Canon believes that the best way to help reps take care of customers is to teach them to take care of themselves. A year ago Canon hired a full-time wellness consultant to help support reps stay healthy and balanced. Yoga courses are taught on site in the evenings, and a smoking cessation program is underway--as is a "biggest loser"-style weight loss challenge. Recognizing how important exercise is to peace of mind, Canon maintains a full gym at the support center. Friendliness alone isn't enough to make customers happy, of course. Canon equips its reps with tools for providing effective support, too. 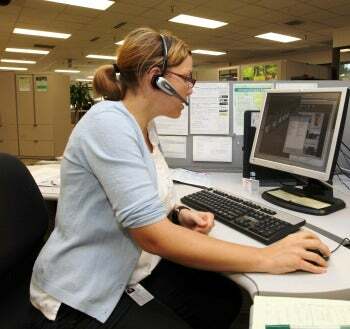 The reps wear wireless headsets so that they can stand up or move around while on the phone. When a rep gets a customer call about a specific camera, the rep walks over to a neatly arranged cabinet and (without the caller's knowing) pulls out the product in question. To help its printer support people, Canon has arranged for various printer model and PC combinations to be wheeled around on carts and shared. The PC on the cart can pull up a number of different operating systems to more closely simulate the environment the users is working in. The customer service reps have two monitors at their desks. One usually displays the PeopleSoft customer relationship management (CRM) system, which Canon uses to store detailed information about the customer's product and support history. The other screen displays the Canon Knowledge Base, a large Web-based repository of information about all Canon products now being used in the wild. The data stored may include how-to's, step-by-step fixes, and detailed product schematics. Online, Canon customers can access the same Knowledge Base that the service reps use, albeit at a lower access level. 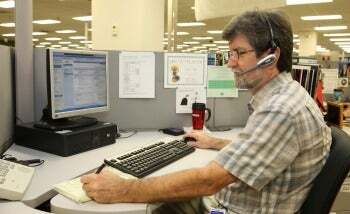 Giving customers access has cut down on the number of calls the support center receives. Seven years ago, Canon customers sought "self support" at the Canon website about six times for every one time they contacted a rep by phone or email. Today, that ratio has grown from 6:1 to 11:1. The Web resources have dramatically reduced the number of phone calls and email inquiries that paid human beings have to handle. But they have also weeded out most of the "easy" calls that support reps used to receive --calls about simple problems with straightforward solutions. These days, most of the calls that reps field involve complex, hard-to-solve problems--and staffers must handle those sorts of calls all day long. Sometimes the customer can be more difficult than the problem in need of resolution, particularly when the rep's answers aren't what a customer wants to hear. This may happen, for example, when the problem rests with the customer's PC operating system or the wireless router, rather than with the printer. I witnessed one such call while I was at the service center--and I was impressed by the rep's handling of it. Though I couldn't tell the precise nature of the problem, I heard enough to surmise that it involved a warranty and that the caller was becoming hostile. The reps at Canon usually have smiles on their faces (or looks of concern), but the rep in this case was not smiling. Still, she remained courteous to the customer, even when she suggested terminating the call because the caller had become insulting and the discussion had strayed far from any support issue. Handling complicated problems and difficult customers all day long sounds like a recipe for burnout. But Canon has adopted a smart strategy to prevent this. 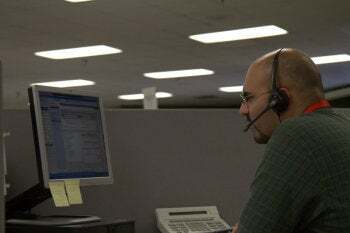 The company gives its reps flexibility by expecting them to be on support calls only 80 percent of the time during their shift; the rest of the time they may spend doing whatever they like. I've heard a lot of companies brag about how wonderful their support is, but Canon's U.S. support operation has backed up its claims in past years with strong performance in our survey results. We've just completed our 2011 Reliability and Service survey--and when we tally up the numbers, I'll be very surprised if Canon didn't perform well again this year. Canon proves that the methods a company uses to provide support information can be as important as the actual content of the support in influencing how customers feel when the call is over. And customers are likely to remember the experience when deciding which brand to choose the next time they're in the market for new gear. In a better world, Canon's customer service methods wouldn't be exceptional; they'd be matched, if not exceeded, by the support operations at every other tech product company. That's a world that all consumers deserve to live in.